The post HyperFlex 4.0 and Veeam Availability Suite 9.5 Update 4 deliver big! appeared first on Veeam Software Official Blog. Ever since 2013, Veeam and Cisco have been partnering close together to deliver solutions addressing the needs of our joint customers. Our customers have grown to expect the Cisco and Veeam hallmarks — performance, manageability and reliability. Our relationship continues to evolve and grow deeper. We started with meet-in-the-channel solutions with reference architectures based on Cisco UCS storage servers, then added integration to HyperFlex snapshots. And in 2017, Veeam was selected as global ISV partner of the year and was also added to the Cisco price list to allow partners and customers easier access to our joint solutions. Recently we announced a new joint solution, Veeam Availability on Cisco HyperFlex. This new solution brings together the power of Veeam Hyper-Availability Platform and Cisco’s industry-leading Hyperconverged Infrastructure (HCI) solution, HyperFlex to deliver an enterprise-grade, highly available Intelligent Data Management platform. So, what’s different? To date, Veeam has worked with Cisco HyperFlex through native snapshot integration to provide data Availability for HyperFlex data, HyperFlex as the data source. With the introduction of Cisco HyperFlex with large form factor drives (LFF), Veeam can now utilize HyperFlex as the target for the Veeam backup repository. In fact, all the Veeam services — the backup manager, proxy servers and repository — can efficiently run on the HyperFlex platform. The result is complete peace of mind. The combination of Veeam on HyperFlex means customers get all the benefits of two industry-leading vendors from brands they can trust. Now the data protection platform is protected against node or disk failure and Veeam can leverage advanced resiliency features in HyperFlex like failover, clustering and self-healing. Add HyperFlex’s seamless horizontal scalability of storage and throughput and you now have an enterprise class solution. This joint solution can easily meet the needs of enterprise IT organizations that are struggling with unreliable legacy technologies that cannot scale and are unable to provide the Hyper-Availability today’s enterprises require. Check out this new solution brief to learn more about Veeam Availability on Cisco HyperFlex. The post Veeam Availability on Cisco HyperFlex is here appeared first on Veeam Software Official Blog. Buenos dias from Cisco Live in Barcelona! You know what makes Spanish paella so delicious? It’s the blending of a variety of ingredients into a succulent dish chock full of flavor. The perfect marriage of meat, seafood, rice and seasoning to deliver a dish that is both beautiful and absolutely yummy. The Cisco and Veeam partnership reminds me a lot of a perfect paella. Mix the two together and you get a perfect Availability solution chock full of features, functionality and real value for our customers. And today, it gets even more tasty with the announcement of Cisco HyperFlex 3.0 their, next generation hyper-converged infrastructure platform. I have been a fan of HyperFlex since its inception. As so often happens, it’s not the first technology to market that ends up being the best, it is often the second or third who develop their solutions based on the experiences of the original ground breakers. Based on the award winning UCS platform Cisco HyperFlex, it brings agility and the ease of use of cloud-based economics to the modern data center. Unlike others, it allows you to scale individual components, like compute and storage, avoiding the need to scale only by adding additional nodes. It utilizes UCS manager so you can manage not only your hyper-converged infrastructure, but also any UCS storage servers in your environment, which is a big advantage over standalone hyper-converged infrastructures. Now HyperFlex gets even better! With the HyperFlex Multi-Cloud Platform announcement, they have added support for Hyper-V, centralized cloud-based management, increased compute and storage node cluster scale, Flex Clusters which allow HyperFlex to be operated across data center locations, cloud mobility and self-service features with CloudCenter, and workload optimization with Cisco Workload Optimization Manager (CWOM). With the addition of Hyper-V, Cisco HyperFlex can take advantage of Veeam’s Windows server 2016 functionality for production checkpoints and resilient change tracking and offer enterprise-grade data protection for application running in Microsoft Hyper-V environment. While that sounds like a lot, I think you can see there is a definite theme. It’s all about the cloud, and more specifically, it’s about multi-cloud which makes sense as we live in a multi-cloud world. In fact, Cisco is now positioning HyperFlex as HyperFlex Multicloud Platform: an adaptive platform enabling customers to power all their applications with the simplicity of hyper-convergence at a multi-cloud scale. What they are talking about is the ability for customers to deploy and provision at cloud-like speed, consume compute and storage resources as needed, and be able to power any application including multi-cloud hybrid applications efficiently and economically. At Veeam, we totally embrace this philosophy across physical, virtual and cloud environments, delivering the #1 Availability for any app, any data, across any cloud, supporting any application on any cloud. In case you missed it, Veeam announced our very first acquisition of N2WS to further broaden our offerings in Amazon AWS environments. With HyperFlex adding Hyper-V support, there is a pretty good story here with Cisco + Veeam + Microsoft. Now customers that utilize HyperFlex with Hyper-V will get the full support of Veeam to back up and replicate their HyperFlex environments, and they can take advantage of the full breadth of Veeam’s Microsoft solutions. Our seamless solutions provide customers the ability to back up to Microsoft Azure with a cloud service provider, lower costs by archiving data to Azure, mitigate risk by backing up Office 365, and ensure Availability of cloud-based workloads with the protection of Azure virtual machines. Cisco and Veeam offer our customers modern solutions to meet their Always-On Enterprise challenges. Recently, we announced our third Cisco Validated Design (CVD) for Veeam and HyperFlex, Cisco HyperFlex with Veeam Availability Suite for Multisite Deployments. This builds on the announcement made at the end of 2017 that Veeam is available in Cisco’s dCloud which is a cloud-based platform that provides a powerful way for customers to demo the Veeam and HyperFlex solutions, including our unique native snapshot integration with HyperFlex. Additionally, Veeam was awarded the prestigious Cisco Global ISV partner of the year for 2017 which demonstrates just how advanced our relationship with Cisco has become. While 2017 was quite the year for Cisco and Veeam, I am looking forward to even more greatness in 2018. ¡Salud! Want to learn more about Cisco HyperFlex and Veeam? Check out our Cisco HyperFlex + Veeam resource page. The post Cisco HyperFlex Multi-Cloud Platform adds Hyper-V support appeared first on Veeam Software Official Blog. I’m dusting off my cowboy boots and getting ready to head down to the Lone Star State (Texas) for Cisco’s annual partner summit in a couple weeks. The Cisco Partner Summit is their premier, invite-only partner event held annually for their top partner executives. This year’s theme is “OWN IT,” and as it rapidly approaches, I thought about how Veeam and Cisco is well on their way to OWN IT and enable their customers to do the same, together. In the technology world, where partnerships are typically “coopetition,” it makes me appreciate how unique the Veeam and Cisco relationship truly is; there are no overlapping competitive technologies. Like the Texas Two-Step, a country western dance that requires partners to work together and be totally in sync, Cisco and Veeam work hand-in-hand to help our customers innovate and modernize their data centers. Cisco delivers the perfect platform for running Veeam’s industry-leading Availability solutions in the UCS series of storage servers that combine high performance, ease of use and reliability. The big news is that Veeam has been chosen as one of a select group of ISVs to participate in Cisco’s SolutionsPlus program, which will make Veeam available in the Cisco Commerce Workspace (CCW), which is the quoting and configuration tool that Cisco and their partners use. Cisco SolutionsPlus delivers a one-stop ordering experience that means resellers building solutions with Cisco UCS and Veeam can quote and purchase the two together. For customers, that means they can have the confidence that these configurations are pre-validated and sized for workloads, significantly reducing risk with the deployment. But that’s not all! Veeam can also be quoted and configured with Cisco HyperFlex, their next generation hyper-converged infrastructure that is getting accolades across the industry. Earlier this year, I wrote about Cisco adding Flash to HyperFlex, which to me, signaled that HyperFlex was ready for any application or workload in the data center. Now the best part, Veeam has unique integration with HyperFlex’s native snapshots, providing faster backups without impacting performance on the production systems, thus lowering RPOs — it’s another example of Veeam and Cisco doing the perfect Texas Two-Step. Another win-win for customers, HyperFlex is ready for any workload, and Veeam delivers the lowest possible RPOs providing Availability for the Always-On Enterprise. The Veeam and Cisco partnership has been steadily maturing and going deeper. Beyond being in CCW and the native integration with Cisco HyperFlex, Veeam and Cisco have worked on a variety of reference architectures and Cisco Validated Designs (CVDs). In the last year, Cisco has added a CVD for Veeam and HyperFlex design, another one for implementation and soon there will be a new one for distributed environments and remote office, branch office environments. Also coming soon, Veeam will be part of Cisco dCloud, which provides an online way to offer demos, training and sandboxes for Cisco architectures. This means partners will be able to easily show the way Veeam integrates with HyperFlex and sizzles with Cisco UCS. It is truly a testament of Cisco and Veeam working together to bring best-of-breed solutions to our joint customers. And customers agree too. In a recent ESG paper surveying our joint customers, the traits most often sighted for choosing Cisco and Veeam were performance, manageability and reliability. Are you a customer or partner benefiting from Cisco and Veeam’s close collaboration? Share your experience in the comments section. The post Veeam in Cisco SolutionsPlus program and other big news from Cisco + Veeam alliance appeared first on Veeam Software Official Blog. It’s been about a month since Veeam’s annual user and partner conference VeeamON, which was held in New Orleans, Louisiana this year. I’m still missing the casual, free spirited vibe of the Big Easy and of course New Orleans-style Cajun cooking. If you’ve ever been to New Orleans, you’ve probably seen Tabasco hot sauce on the tables at practically every restaurant. I’m a firm believer that hot sauce makes good food taste even better and such is the relationship of Cisco and Veeam. By combining the two, you get something even better. According to the latest ESG white paper, Veeam and Cisco UCS Are Better Together, reliability, performance and agility were highly touted characteristics when selecting a combination of Veeam and Cisco UCS over their respective alternatives. The post Veeam and Cisco cook up something hot appeared first on Veeam Software Official Blog. In the iconic Charlie Chaplin film, “Modern Times,” there is a classic scene where he tries to keep up with an ever-moving assembly line with the expected results you might envision. It’s a good image to keep in mind when considering today’s IT technology. The IT world is moving fast and the expectations on the services they deliver is ever increasing with of course, ever shrinking budgets to meet these demands. The world of technology is squarely in the middle of the digital transformation. The adoption of virtualization and hybrid cloud technologies is dramatically changing the way IT can deliver applications and services. There are new expectations for agility, simplicity and, perhaps most importantly, Availability. Customers, partners and employees expect applications and data to be available always, in all places and on any device. But there is another more fundamental change happening, regardless of the industry, the size of the company or their location — today’s modern enterprise is changing the way they deliver their goods and services. EVERY company is becoming a software company, and with this change brings a new set of IT challenges. And if companies aren’t investigating ways to change their business models, they’ll likely have to compete against a company that has. Technology has never been so important as a competitive advantage. One of the fundamental tools that is enabling and driving the digital transformation is converged infrastructures. The reason for the massive adoption of converged infrastructures is straight forward: Combining compute, networking, storage and virtualization provides more efficiency and predictable performance and deployment. These systems are a pre-integrated stack of technology that are pre-configured for particular applications and workloads and are optimized to work together. This eliminates a great deal of management and fine tuning which frees up those resources to focus on higher-value projects. But convergence was just the first step. To gain even greater agility and efficiencies, we are seeing a rapid adoption of hyper-converged systems. With a hyper-converged infrastructure, a software layer and common management are added to the equation, giving even tighter coupling of the components. 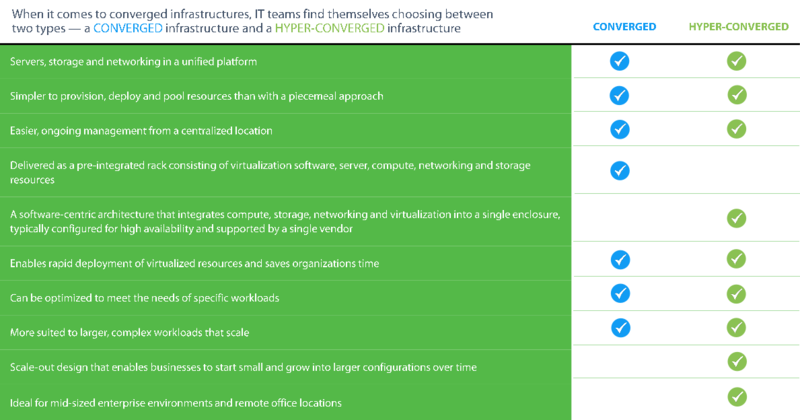 In fact, that’s one way to distinguish the difference between hyper-converged and converged infrastructures: With converged, you have separate components pre-configured and validated with one another, but still separate components — with hyper-converged, it is a single system in which all the components work together as one. So, which is right for you? Well, that depends. It used to be that converged infrastructures were deployed for larger, more mission-critical workloads while hyper-converged was deployed for specific-use cases such as VDI or remote office. But with hyper-converged systems becoming more available with enterprise class storage (flash) and faster networking, the lines are blurring. As you adopt modern infrastructures as part of your digital transformation, it is imperative to adopt a modern data protection that is ideally suited for these solutions. In fact, at Veeam we are changing the way the world thinks about data protection. Instead of data protection, we frame it as Availability. If you think about it, it is a logical next step. Why do we backup? In case we need to recover something. Why do we recover? It’s really to keep data and applications available. Veeam Availability Suite delivers an innovative approach to backup, replication and recovery. It’s designed to offer the highest levels of Availability in today’s highly virtualized environments. It is convergence-agnostic, meaning it will work with any of the industry leading converged or hyper-converged systems. It is also tightly integrated with leading storage and hyper-converged systems vendors using storage snapshots to ensure application Availability. Veeam Availability Suite offers rapid recovery of what you want, the way you want it with low recovery point objectives and streamlined disaster recovery, plus 2-in-1: backup and replication. Veeam provides verified recoverability of every file, application, or virtual server, every time through automated testing with audit trails. Veeam Availability Suite is the modern data protection you need for these modern times, regardless of the infrastructure that you are using or considering for deployment. Learn more on what’s right for you in our white papers: Building a Converged Infrastructure that Just Won’t Quit and Essential Guide to Data Protection in Hyper-Converged, Converged, and Hybrid Environments. The post Modern times demand modern solutions — why convergence is the way to go appeared first on Veeam Software Official Blog. Want fries with that hyper-converged infrastructure? Hyper-converged infrastructure environments are increasing in popularity for many reasons, especially for ROBO (Remote Office / Branch Office) environments. They are integrated software-defined systems that combine compute, network, storage and virtualization with a software layer that provides a single system of managed IT. Hyper-converged infrastructures are easy to deploy, manage and offer IT agility and flexibility as well as a decrease in operational costs and the resources needed to manage them. Hyper-converged has provided the next logical evolution in IT after converged systems. Converged systems pre-integrate IT components (compute, data storage and networking). These components are pre-validated bundles that are likely from separate hardware manufacturers. They are pre-assembled and configured before shipping to the data center. The end result is a predictable deployment with minimal compatibility issues. Converged infrastructure is designed to operate with specific workload types and capacities that provides customers very predictable and streamlined times to deployment as well as an increased return on their investment. Hyper-converged solutions offer the next step in IT infrastructure evolution by integrating compute and direct-attached storage into a single software-defined IT resource. This environment is then managed from a common interface. One key characteristic of hyper-converged infrastructures is the ease of scaling when additional storage capacity or processing power is required, simply add additional nodes. Hyper-converged systems provide all-in-one, compute and storage building blocks that can provide many good availability features like self-healing, clustering, replication and failover. These are all good for keeping the platform running, but really don’t complete the data and overall application Availability picture. It’s like ordering a cheeseburger without fries, who does that? Veeam challenges the Availability Gap; the difference between what IT can offer to the business in terms of RTO and RPO versus the demands of their Always-On 24.7.365 business requirements. Hyper-convergence gets you part of the way there, but to truly maximize your hyper-converged systems you need to upgrade your data Availability strategy. To achieve the highest levels of data Availability you need the combination of both backup as well as replication. Replication will provide the best RTO’s whereas backup will provide much longer term system archival. Many benefits can be achieved from a solution that was purpose built for highly virtualized environments. For example, a common challenge is testing a DR strategy. A second example, is how fast can I recover an individual item, MS Exchange for instance. A good example of getting a complete meal is Cisco HyperFlex with Veeam. HyperFlex is the Cisco hyper-converged infrastructure offering that provides many built-in platform Availability features like clustering, self-healing and failover. When paired with Veeam Availability solutions you have a robust data Availability solution. This solution will provide incredibly fast restore operations, enhanced application-level item recovery and blazing backups. 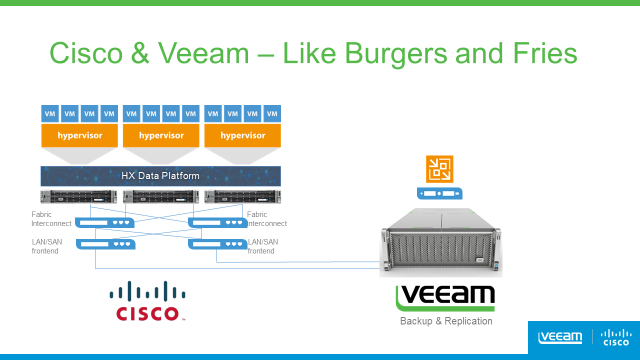 Veeam complements Cisco HyperFlex like fries complement a cheeseburger, to ensure Availability by enabling automated recovery, site-to-site replication and the ability to test and verify off-site replica data. Together they are better! Cisco and Veeam enable IT to gain greater efficiency and infrastructure agility, greatly reduce operational costs and dramatically reduce risks. They provide unified data protection, fast and flexible recovery and replication so end users have 24/7 data and application access. To learn more about Cisco HyperFlex and Veeam together, read the Tech Target white paper. If you’re already running an environment on HyperFlex with Veeam be sure to upgrade to Veeam Backup & Replication 9.0 Update 2. This update provides support for Direct NFS backup mode. To truly maximize your investment in hyper-converged or converged infrastructures, be sure to ask for fries with it and get a complete data Availability solution. The post Want fries with that hyper-converged infrastructure? appeared first on Veeam Software Official Blog. Cisco & Veeam — Like Peanut Butter & Jelly. Learn more at Cisco Live! In the lead up to Cisco Live in Las Vegas, I was reviewing my schedule when I realized just how deep the relationship between Veeam and Cisco has become. So many things are happening on so many different fronts, it’s really quite impressive especially given the current age of “coopetition”. In Cisco, Veeam truly has a joint partner on so many levels. Let me recap some of the good things with Cisco and Veeam together. With Cisco UCS, Veeam has an ideal platform for our Availability solutions. Cisco UCS has tremendous performance, flexibility and modularity with high-density storage servers, and when paired with Veeam’s Availability solution it protects VMware VSphere and Microsoft Hyper-V environments. We have been working with Cisco on pre-validated and tested configurations for a meet in the channel solution for the last several years. These solutions have been very successful and are well received by customers, partners and service providers. The solution is ideal for customers of varying sizes and can easily scale and grow, as customers require. We are seeing tremendous success as the two combined help customers meet the most rigorous recovery time and point objectives required for tier-1 applications and data. By providing fast, flexible, and reliable recovery of virtualized applications and data, our combined technologies help enterprises overcome the challenges of maintaining 24.7.365 Availability. Watch Jason Buffington of ESG do a much better job of illustrating the two together. If you are unfamiliar with Cisco’s HyperFlex, it is their hyperconverged infrastructure combining compute, storage, networking and virtualization into a simplified, easy-to-use system that brings new levels of speed and efficiency to IT. Cisco HyperFlex includes an integrated network fabric, powerful data optimization and unified management to deliver the full potential of hyperconvergence for a wider range of workloads and use cases. Inherent to HyperFlex is native Availability functionality such as self-healing, clustering and failover to ensure high Availability. Veeam complements Cisco HyperFlex to deliver data Availability, protection and disaster recovery. Veeam delivers efficient VM backup and replication to dramatically lower the recovery time and point objectives of <15 minutes for ALL applications and data. Veeam replication between HyperFlex clusters, both local and distributed, provides site-level disaster recovery (DR). And the best part – you can use Cisco UCS as the backup server and repository. If you want to learn more and will be at Cisco Live, attend our session “Learn How to HyperFlex YOUR Virtualization and Availability Muscles with Cisco’s Hyperconverged Systems and Veeam”, on Monday, July 11, at 2:15 p.m.
To quote the old TV advertising, “But wait, that’s not all” – Veeam Cloud Connect is Cisco Powered Ready giving service providers confidence in adopting the solution as part of their offerings. Cisco also offers valuable financial incentives for offering Cisco powered services, so Veeam is an attractive solution to both customers and partners as part of a DR as a Service (DRaaS) offering. Veeam customers can now have off-site disaster recovery without having to invest in a second data center. As the relationship between Cisco and Veeam grows, look for it to evolve even further, stay tuned and see you at Cisco Live in Las Vegas! The post Cisco & Veeam — Like Peanut Butter & Jelly. Learn more at Cisco Live! appeared first on Veeam Software Official Blog.